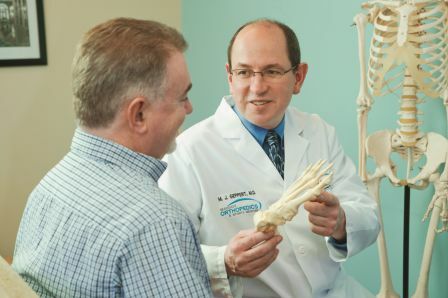 Seacoast Orthopedics & Sports Medicine is a leader in foot and ankle surgery, a highly specialized practice. Dr. Mark Geppert, a fellowship-trained surgeon, was one of the first in the region to apply arthroscopic techniques to the treatment of subtalar joint problems. He has published many articles in a variety of orthopedic journals. With clinical experience in treating injuries ranging from sprains and stress fractures to arthritis and deformities such as bunions, club feet, and hammertoes, we offer a full spectrum of casting and bracing options and work closely with onsite prosthetic and orthotic experts for custom-molded inserts and braces. Initial Evaluation: What Kind of Shape are Your Feet In?